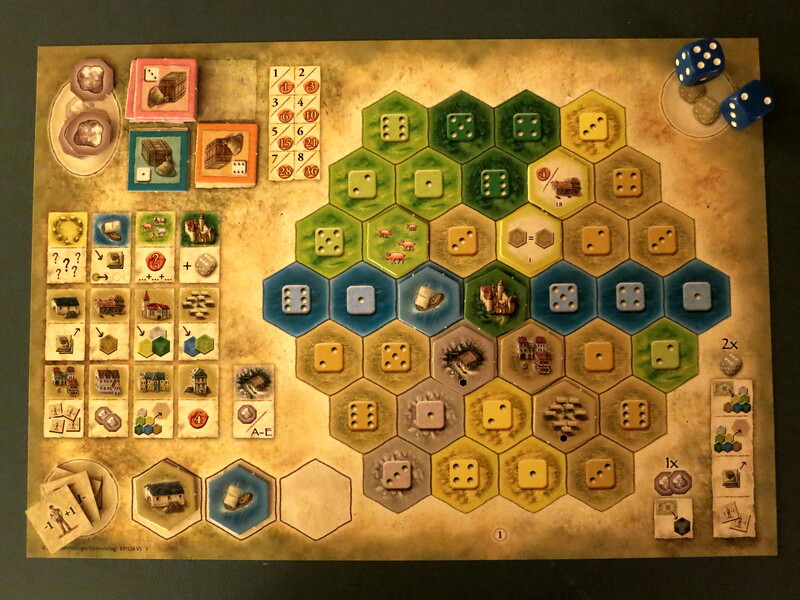 The Castles of Burgundy is a “Eurogame” played in five phases for 2-4 players. It blends tile placement and die rolling as its major mechanics into a fairly unique strategy game of optimization and capitalizing on presented opportunities. Although it’s more of a backdrop than something critically tied to gameplay, the theme of creating the best “estate” during the 15th century provides a nice backbone for separating the types of tiles and (due to stunning thematic art) gives the game a great aesthetic. Gameplay: The core gameplay is elegant and relatively straightforward, but the large variety of options and different powers available based on what tiles you play makes the game very deep and strategic. Luck determines a fair bit about the choices you’ll have, but the game is more determined by the choices than the luck. The goal is to have the most victory points by the end of the game. Earning points is always related to placing hex shaped tiles on your game board, but there are a lot of variations. I’ll give examples below. 1) The game board has a lot of information, reminders and spaces for setup, as well as score and turn order tracks. As such it is a bit busy even though it is well laid out. The most important parts to get an idea of gameplay are the six numbered areas (corresponding to the faces on a normal die) from which tiles can be claimed and the central area from which hex tiles can be bought . 2) Player boards, along with likewise containing a wealth of information and symbols, have a map of their estate of 37 hex shaped spaces that have varying colors and die numbers on them, as well as three hex shaped storage spaces and three square shaped storage spaces. 3) There are six different colors/types of hex tiles, all representing things that can be added to improve your estate: buildings, animals, “knowledge” (we generally call them “technologies” or “enhancements”), mines, castles and ships. Each have their own effects and powers. 4) During each round all players will roll two dice and use them one at a time to either – take a tile from the matching numbered area on the board into storage – place a tile from storage onto an appropriately colored space with matching number on their map – claim two worker tokens (die number doesn’t matter). Once per turn a player can also buy from the central area. Player use the effects of the hex tiles when they are placed on the map. The workers are key to the genius of the game balance and strategy – each token can be redeemed to change a die roll one value higher or lower, and they can be redeemed several at once. This gives players control to mitigate the effect of luck if needed. 5) Highest score after five phases of five rounds wins. 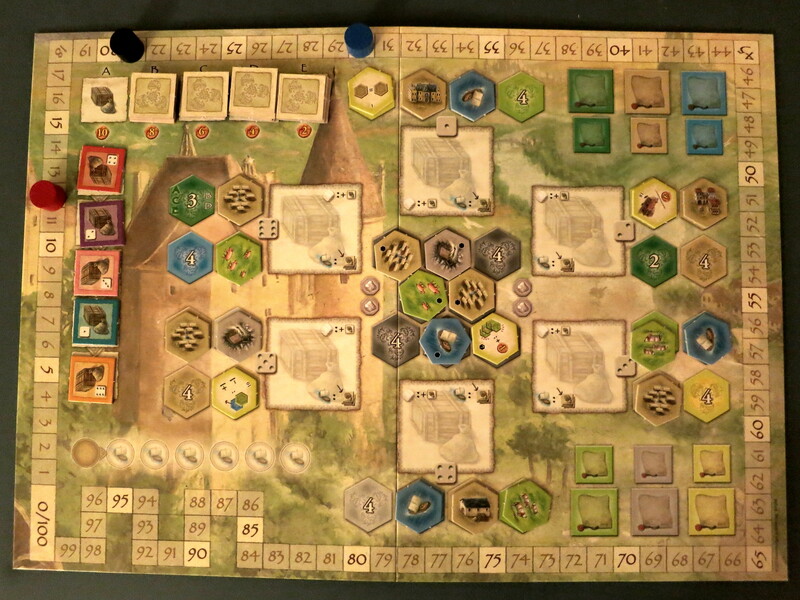 Points come from a large number of possible methods, including placing special buildings, completely filling in sections of your player board, being the first to fill all spaces of a color, collecting animals of the same type, selling “goods” (square tiles that can be claimed from the gameboard), etc. I’m obviously skipping a lot of details, but that should give an idea of what the game is like. It’s harder to explain than it is to learn, but note that I’m speaking from the point of view of a regular, veteran gamer. This is NOT an entry level game. Overall: The Castles of Burgundy has a ton of pieces and somewhat complicated set up, but the setup is to keep the game balanced (certain spaces aren’t used depending on how many players you have) and it’s not too bad if you keep the different types of hexes separate during storage (I use small ziplock bags). The game scales perfectly with the number of players and the mechanics are a lot of fun. The player boards are double sided, with a standard identical board on one side and unique boards on the other. So beyond the variation each game will have just from the tiles, the unique boards can be used to increase the dynamic and replayability. One other thing to mention is there isn’t really direct player interaction – someone might take tiles you had your eyes on, or get a fulfillment reward first, but that’s about it. It didn’t bother us at all, but if you’re more into confrontation style games this won’t fit the bill. As is probably clear by now I loved The Castles of Burgundy. It’s an innovative take on tile placement games that I can see myself playing for a long time to come.